Every now and then you receive an email with a URL in it that makes you pause and think. Maybe it’s from a colleague or a friend, and almost looks legit, but something is telling you it might not be. Maybe you are doing your own research on a subject matter that may lead you down a path where you have to visit a site that you strongly suspect will be bad, but nevertheless you still need to go there to complete your research. I would suggest police and journalists may face this dilemma on a daily basis. Sometimes even as an IT professional, seraching for an elusive old driver can get you there. Microsoft are doing their best to detonate URLs via their safelinks – Office 365 ATP Safe Links https://docs.microsoft.com/en-us/office365/securitycompliance/atp-safe-links but what if they miss something, or your email is not even on Office 365. What is Application Guard and how does it work? Microsoft Edge running in Application Guard provides enterprises the maximum level of protection from malware and zero day attacks against Windows. Windows Defender Application Guard for Microsoft Edge is a lightweight virtual machine that helps isolate potentially malicious website activity from reaching your operating systems, apps, and data. If an employee goes to an untrusted site through either Microsoft Edge or Internet Explorer, Microsoft Edge opens the site in an isolated Hyper-V-enabled container, which is separate from the host operating system. This container isolation means that if the untrusted site turns out to be malicious, the host PC is protected, and the attacker cannot get to your enterprise data. There is no persistence of any cookies or local storage when an Application Guard window is closed in Microsoft Edge. 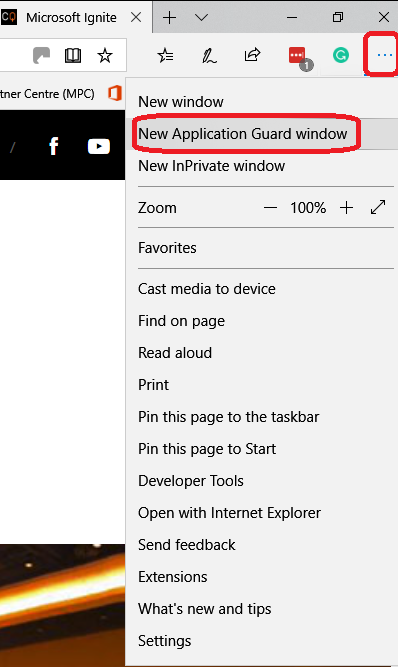 Application Guard isn’t new to Windows 10. It was a feature introduced with the Fall Creators Update, but it was limited to Windows 10 Enterprise. Starting with the April 2018 Update (version 1803), the feature is now available for devices running Windows 10 Pro with processors that support virtualization. 4. 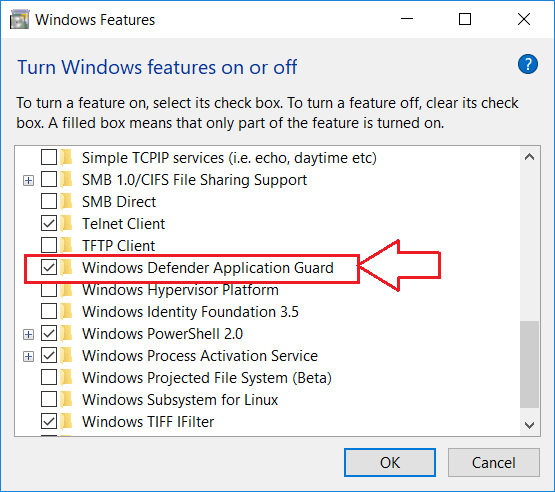 Check the Windows Defender Application Guard option. Once the feature is configured, you can use Microsoft Edge (or Internet Explorer) to browse untrusted sites using a separate Hyper-V container, which is a separate environment from the main installation of Windows 10. Then if the site tries to deliver malicious code, your computer and data will be protected. The first time you run this, it make take some time to prepare your machine but future sessions will open more quickly. After completing the steps, a new virtualized environment will be created automatically to completely isolate the web browsing session from your computer. Conrad Murray has been working in IT for over 15 years specializing in the Messaging Arena and in particular IBM Domino and Microsoft Exchange and now of course Office 365. Working with like minded colleagues now specializing in very large scale complex migrations from Lotus Notes and On-Premise Microsoft Exchange to Office 365.